And Some Dude Named Jeff is, to my mind, notable for a few reasons. First, it's the first Librarians episode that I have genuinely enjoyed, even if it was not the smartest or the most original of stories. Second, it's a love letter to the fanbase, those Librarians In Training, and the wacky world they occupy. There may be a temptation to say And Some Dude Named Jeff actually mocks fan culture in general and Librarian fans specifically. I could see that; however, I think the people behind The Librarians genuinely care and respect their fanbase, so I look upon And Some Dude Named Jeff more of a gentle spoofing than a downright mockery. 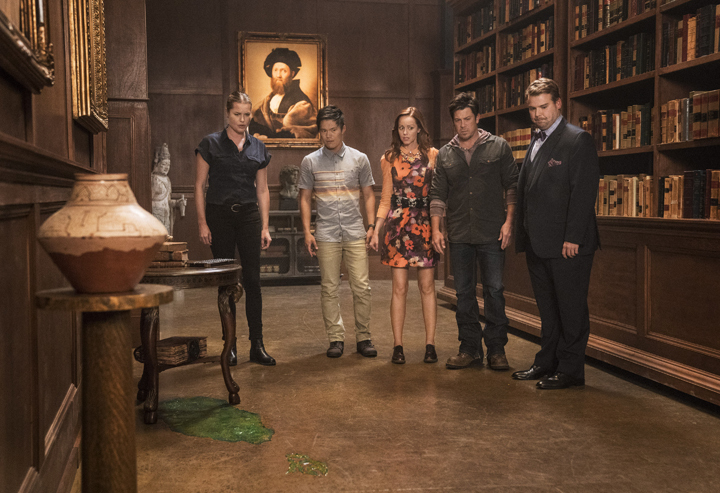 The Librarians notice that Jenkins (John Larroquette) is acting a bit strangely: less stuffy, almost flirtatious with Librarian Cassandra Cillian (Lindy Booth), high-fiving and smacking the backside of Jacob Stone (Christian Kane). There is something amiss, but they can't quite figure it out. They put it down to aftereffects of Jenkins now becoming human, but the Real Jenkins knows the truth. The Real Jenkins is shocked to find himself waking up in a basement filled with posters and him wearing a rock band t-shirt. He's also shocked and appalled to be ordered about by a woman who insists he's his mother Dolores (Jeanine Jackson). Things get stranger and stranger as a group of people from Gadget Gang come sweeping in, telling him they are all going to be late for work if he doesn't get himself together. Jenkins is perpetually befuddled by this group, more so when they get together in the basement to play Dungeons & Dragons. He's realized that he has switched bodies with Jeff Peppers (Andrew Caldwell), a 28-year-old whose life is stuck in second gear, and it hasn't been his day, his week, his month, or even his year. If you get the reference, you are a Gen-Xer. It isn't until Jeff's friends start the game that Jenkins realizes that Jeff has based the characters in this version on The Librarians themselves. Aurora (Britney Young) has the character 'Cassandra the Sorceress', the more mature Dennis (Joseph Bertot) is 'Stone the Ranger', and Dragon Master Schmidt (Ryan Schwartz) is 'Flynn the Wise Sage'. There is no one to be 'Baird the Warrior Princess' or 'Ezekiel the Cunning Thief' (his character I think was eaten). Jeff always plays his favorite character: Jenkins. Jeff is pretty obsessed with Jenkins, down to donning cosplay of our cantankerous Caretaker. The group as a whole has built up the characters thanks to Wikileaks dumping DOSA files and certain newspaper reports by a certain Sarina. Jenkins realizes that Jeff has literally switched places with Jenkins, and now it's up to Jenkins to break into the Library and set things right. This is more important since Jeff has used a book found at an online auction to cast the spell. This book, The Asmodius Grimoire, belonged to Merlin, and in it he had locked up Asmodeus, one of the Seven Princes of Hell. With Jeff having used it, he has inadvertently released Asmodeus and worse, brought him into the Library. Jenkins' odd behavior has now made the Librarians aware something is wildly wrong. They put 'Jenkins' to the test by having him translate an ancient text. Obviously, the False Jenkins cannot, and he confesses the truth: all he wanted was to be Jenkins for a little while to perk up his humdrum life. Unfortunately, this slacker is no hero, especially as he hides from this monster. The Real Jenkins sees that he needs Aurora, Dennis and Schmidt to break into the Library through the backdoor, something he finds quite horrifying. The backdoor has many traps, but each of our D&D fans brings his/her own skills to thwart them. A puzzle is easy for Schmidt, going past a booby-trapped hall requires Aurora's dance skills, and Dennis tells Jenkins a story about perseverance that he tells his children, which inspires Jenkins to literally break on through. Despite their teamwork, Jenkins insists that they cannot enter the Library itself, much to their disappointment. However, for their work, Jenkins dubs each of them Honorary Knights of the Round Table. Real Jenkins is most displeased to find False Jenkins, insisting he return his body and Jeff return to as Real Jenkins puts it, 'his short, slightly overweight body'. Jeff knows he's afraid and that his life is awful, but having spent time in Jeff's world, Jenkins sees what Jeff does not: Jeff has passionately loyal friends, a mother who genuinely loves him, and the possibilities of a wonderful life if he chooses to have one. Jeff has to focus on the positives. He also has a Prince of Hell to face off against. After a quick stop to use a reversing potion, Jeff and Jenkins rush to Jeff's home to retrieve a stone that contained a bit of Asmodeus' power. That stone, however, Jeff had given to his mother as a birthday gift. It's a battle between Slacker Jeff, Sir Galahad, and Asmodeus for the sake of the world. Asmodeus is defeated by the Real Jeff, who has overcome his fears. Jenkins has found that 'people can be quite delightful', and rushes off to a 'meeting'. That meeting? 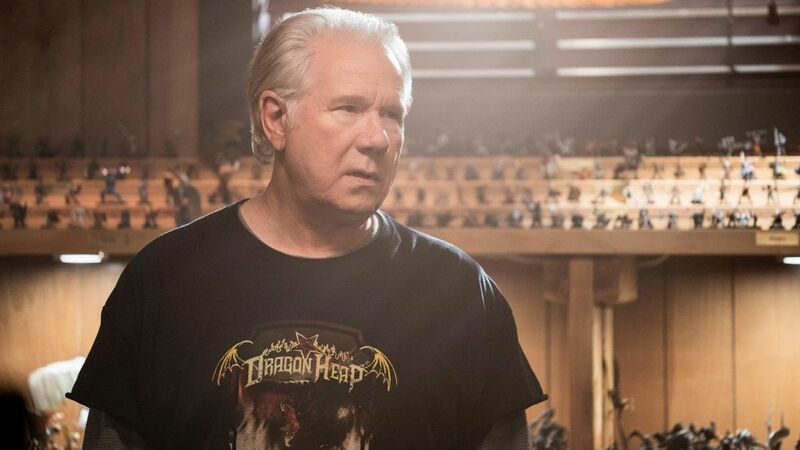 A game of Dungeons & Dragons, where Jenkins brings pizza and insists his expertise on all matters supernatural make him the natural choice for Dragon Master. And Some Dude Named Jeff is something we haven't seen from The Librarians in a while: a genuinely sweet story that has menace but also has heart. There is a danger of sorts (like many one-off monsters, Asmodeus isn't going to make a return appearance), but for the most part And Some Dude Named Jeff is a lark, a nice romp where we can focus on characters. In this case, it's Jenkins, and Larroquette has a wonderful turn, giving him a chance to show off his great comedic skills: after all, one of his signature roles was in the sitcom Night Court. It's in the blending of Jenkins' person in Jeff's life that makes things funny: Jenkins' befuddlement over how automobiles operate or seeing do his take on Dance Dance Revolution that sells the premise. There are few things as amusing as seeing the ever-stuffy Jenkins, in full metalhead t-shirt, remark on someone's 'short, slightly overweight body'. And Some Dude Named Jeff is meant to show Jenkins' evolution to a softer, almost cuddly figure. And Some Dude Named Jeff is also highlighted by its guest stars, specifically Caldwell as our fanboy. He has to play someone who is both fan and individual, someone who fills his unhappy life with friends who are in their own way also outcasts in a fantasy world. It cannot be a coincidence that Jeff has a photograph of himself dressed up as Jenkins, the nod to those Librarian cosplayers and cosplayers in general a nice one. In turns endearing and inept, with curious turns of phrases (calling Cassandra 'Sassy Cassy' and Jacob Stone as 'Stoner'), it be nice to see Caldwell's Jeff make a return appearance. It be nice to see all of them return again, as they would make a fine group to keep tabs on. And Some Dude Named Jeff also has a unique aspect: it is Librarian costar Lindy Booth's directorial debut, and she proves herself a good director. The episode didn't lag and balanced those moments of humor (the Dance-Off) with heart (Dennis telling Jenkins the rabbit story he tells his own kids). The episode isn't perfect. Jenkins' denial of letting the others into the Library was a quick and easy way to get rid of the characters, and in retrospect it shows a wild inconsistency. Jenkins is stricter about letting visitors in, since he denied this group entrance while Stoner showed Sarina around. Now, maybe Jenkins wasn't aware that Stone had brought his paramour into the Library, but that does show a bit of a discrepancy. And Some Dude Named Jeff may be my favorite Librarians episode, at least from this season. It's a welcome return to form after some major stumbles, a nice homage/gentle spoofing of fan culture that takes things a bit too seriously but ultimately mean no harm. It was a nice romp, well-acted and directed, and one that I enjoyed.